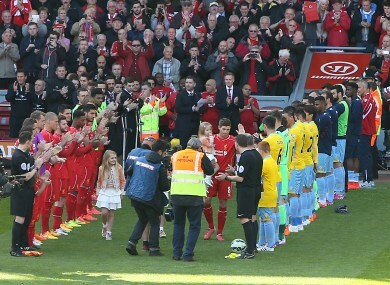 Liverpool's Steven Gerrard walks out to a guard of honour before his final game at Anfield. FOR ALL ITS glorious heights, there is also an element of sadness attached to Steven Gerrard’s career with Liverpool. From winning the Champions League against AC Milan to being humiliated 6-1 versus Stoke in his final game with the club, Gerrard’s lows often seemed as brutal as the highs were heady. Over the course of his many years as a top Premier League footballer, Gerrard has come across as someone not totally at ease with his superstardom. Instead he gives the impression of being an introvert and a chronic worrier, with an innate perfectionism and intense desire to succeed that few other contemporaries can match. This portrait is consolidated and expanded upon in his his autobiography, My Story, released earlier this year. The final part of his career in England was anti-climactic in a sense, as having been in superb form and seeming set to captain Liverpool to a first-ever Premier League title, a costly slip in a crucial end-of-season encounter with Chelsea ultimately led to the opening goal and an eventual 2-0 loss. An angst-ridden Gerrard clearly realised the team had missed their best-ever chance to win the league title as a result. The melancholic undertones lurking amid a decorated career are reiterated when Gerrard’s ghostwriter, Donald McRae, tells The42 of the star’s admittance that “not a day goes by where he doesn’t think about the slip”. McRae himself is distinguished in his own field of sports journalism. A two-time winner of the William Hill Sports Book of the Year award, he was also nominated for the same prize this year after writing an excellent biography of the boxer Emile Griffith, A Man’s World, with a film of the acclaimed book recently being green-lighted. Despite being “exhausted” after finishing the Griffith book last March, McRae promptly undertook the challenging task of ghosting Gerrard’s autobiography, after the Liverpool legend personally asked him to write it. Although both McRae and Gerrard initially were hoping for a year to write it, with the former typically spending three-to-four years on a single project, Penguin’s editor wanted the book out as soon as possible — something that, McRae says, worked out well in hindsight, with interest in Gerrard reaching peak levels amid his Liverpool departure last May. The pair consequently were obliged to work at considerable speed, with Gerrard often meeting McRae on mornings after taxing Premier League games towards the end of last season. Far from the stereotypical cliché-prone footballer, Gerrard does not mince his words in the book and McRae admits he was surprised by the extent of the star’s honesty. He bares his soul in this book and he’s totally candid about his disappointments and shortfalls. One thing that maybe took me back a little bit was that he was more inclined to talk about the low moments than the high moments. “I thought that was interesting, because he said to me he felt he had spoken about winning the Champions League again and again. He didn’t want to go down that particular path but in the end, I did persuade him that we needed to talk about the 2005 Champions League final. Ghostwriting is often portrayed as somewhat of a thankless task, and while acknowledging the challenges that this unfamiliar role entails, McRae says that the experience was ultimately a satisfying one. “It’s important as the ghostwriter to push yourself out of (the book). There were other avenues I would have liked to have explored more, but this is Steven’s book, so I quickly understood that I would be guided by him and I would allow his voice to lead it. The best moment, for me, where I actually felt vindicated, was when he spent such a long time going over the book painstakingly, chapter by chapter, page by page, word by word, which showed me how much it meant to him. There were telephone conversations when he was in LA, emails and texts going back and forth. In the past, sports stars’ autobiographies have caused controversy, with the athlete often blaming the ghostwriter as a result for adopting too much artistic license, notably in the case of Roy Keane and Eamon Dunphy. However, with Gerrard’s book, there was little chance of a similar scenario occurring. “Steven conveyed how much he was going to put into this book and that he cared about it. I think anything he does he wants to do as well as possible and for me, that was so illuminating and heartening. He got paid well to have his name attached to this book and he could have done the bare minimum and not been bothered by it. But it mattered hugely to him, which made me feel like all my hard work was actually worth it. As critical as Gerrard can be of the likes of El Hadji Diouf and Mario Balotelli among many others, he is similarly harsh on himself. The book opens with the now-infamous Chelsea slip and Gerrard describes in detail, the anguish he felt at the time and which he continues to feel, to an extent, as a consequence of that one unfortunate moment in time. “I don’t think he is quite over the slip — it was the devastating moment where he felt Liverpool lost the league title… He does feel in time he will get over it. I think in a small way, the book will help him come to terms with it. The book describes how Brendan Rodgers effectively went back on a promise he made to his captain that he would always be first choice in the big games. After being left out of the starting lineup for the United match, the veteran midfielder’s frustration was swiftly apparent, when Gerrard got sent off for a bad challenge just seconds after being introduced as a second-half substitute. This disappointment meant Gerrard became temporarily reluctant to talk to McRae, leaving the writer concerned that his silence could impact on the book’s strict deadline. Countless headlines were created amid the book’s release, most of which revolved around Gerrard hitting out at various individuals. One of less publicised but nonetheless equally interesting passages of the book related to the Liverpool star’s injury-related depression and subsequent relationship with the renowned sports psychiatrist Dr Steve Peters. Did the psychiatry help Gerrard become a better player ultimately? Another notable passage in the book relates to Gerrard’s wistful reflections on management, as he dreams of managing Liverpool one day, while being realistic enough to accept that this scenario is far from a given. He needs football in his life because he’s extremely obsessed with the game — not as much as Jamie Carragher is, he would say, but I think it defines him. He’s been in love with football since he was a tiny little boy. As much as the slip and other career disappointments continue to trouble Gerrard, the climax of his Anfield career was not without its redemptive moments either. In the book, Gerrard recalls the various opportunities he had to leave Liverpool and move to a number of illustrious clubs, including Real Madrid and Chelsea. The Merseyside-born star admits he would almost certainly have won more trophies if he had joined up with Jose Mourinho in London, or another top European club. However, McRae feels that ultimately, Gerrard genuinely believes he made the right decision in staying at Anfield. And indeed, in a football world driven increasingly by cynicism and money, where ‘loyalty’ is beginning to seem like an archaic term, the star’s dignified stance on the matter is both unusual and refreshing. “In terms of staying at Liverpool, I think he felt totally vindicated. His last game at home was a defeat against Palace. His last-ever game for Liverpool was the humiliation of losing 6-1 at Stoke — that hurt him hugely. But I think he felt so vindicated by the love people showed him in the last few weeks. It showed him what it meant to so many people that he stayed for so many years as a first-team player at the same club. Since the age of eight up until 35, he’d been on Liverpool’s books. And McRae, having interviewed countless elite sports stars for The Guardian over the years, feels Gerrard shares some similar attributes with other legendary athletes. I think the top, top people — someone like Tony McCoy, who’s totally different in personality to Steven, but there is that hunger for perfection, that attention to detail, that kind of obsessive zeal for doing something out of love. He has all the attributes of the iconic figures of sport — they pour out of him. Now, of course, Gerrard is living in the relative serenity of America, in comparison with the football-obsessed city of his birth. As sad as he was to leave his beloved Liverpool, McRae feels that this transition has given Gerrard an unfamiliar sense of freedom, lifting a considerable burden off his shoulders in the process. When he went to the States and I went to see him in LA, I think he was surprised at how much he enjoyed being out of that consuming obsession with Liverpool and football. It had totally taken over his life and interactions with his wife and kids had always been shadowed by this commitment to Liverpool. He enjoyed, in LA, becoming fairly normal and just being a husband to his wife and kids. He’s a good Dad, but away from Liverpool, he had time and he wasn’t famous and he just enjoyed being out of that insanity of being Liverpool’s captain for such a long time. Steven Gerrard: My Story is published by Penguin. More details here. Email “'Forget the medals, you have the love of your people' -- The redemption of Stevie G”. Feedback on “'Forget the medals, you have the love of your people' -- The redemption of Stevie G”.